Erbil, Kurdistan Region, Iraq (cabinet.gov.krd) – Kurdistan Regional Government, KRG, Peshmerga Affairs Minister hailed the role of France for supporting Peshmerga forces, describing the recent visit of the ministry delegation to France, headed by him, and meetings with French President and senior officials as successful and productive. KRG Minister of Peshmerga Affairs, Mustafa Sayid Qadir, in an exclusive interview with the KRG Website, said that France’s support for Kurdistan Region is very important, as it comes at a time when the Peshmerga forces are in a war with an international terrorist organization, the Islamic State, also known ISIS. Sayed Qader stated that it is the duty of all countries to support Peshmerga forces as ISIS is a threat to the entire world. The Minister of Peshmerga Affairs said that the Peshmerga Affairs Ministry delegation, which included a number of field commanders from the battle fronts, briefed the French President and senior officials about the conditions of the war against ISIS. “France has supported us until now by providing arms, ammunitions, and military advisors. French officials pledged more support, and we asked for further military aid, because we are fighting a continuous tough and unequal war”. He highlighted that the meeting between the military delegation from the Kurdistan Region and the French President came at the initiative of French philosopher and writer, Bernard-Henri Levy, who visited the battle fronts in the Kurdistan Region last February, and vowed he will urge the highest authorities in France to provide better and more military assistance to Kurdistan Peshmerga forces. KRG Minister of Peshmerga Affairs also shed light on the role of Germany in supporting Peshmerga forces, particularly by providing Milan anti-tank missile which played a significant role in repulsing terrorists’ attacks. He said that German Defense Minister and several delegations have visited Kurdistan Region, and Germany is currently training the Peshmerga forces. He also highlighted the participation of the Kurdistan Region delegation led by Kurdistan Region President, Masoud Barzani, at the Munich Conference on international security. He said that Germany replied positively to several requests by the KRG Ministry of Peshmerga Affairs, expressing his wishes that Germany and other countries will invite delegations from the ministry. KRG Minister of Peshmerga Affairs pointed out that more than 95 percent of the territories which were captured by ISIS in Kurdistan have now been liberated by the Peshmerga forces. However, he said, this does not mean that ISIS threat on Kurdistan has been definitively repulsed. In another part of the interview, he outlined the duty and works of the Ministry of Peshmerga affairs, particularly during war with ISIS, saying that all Peshmerga forces, alongside with security, police, volunteers, retired forces and military units number 70 and 80, are under the ministry’s authority and led by one command, President of the Kurdistan Region, who is General Commander of Kurdistan Region Military Forces. Any force outside this framework, which may belong to any side or party, is considered illegal according to the KRG and Kurdistan Region’s overall policy. KRG Minister of Peshmerga Affairs said that there was a plan for those Yazidi, Christian, Kakayee, Turkman and Shabak citizens who showed interest to form military units to defend their areas like Peshmerga forces. Those unites were formed within the framework of the Ministry of Peshmerga Affairs, and have been trained by the ministry and sent to the front lines. He reiterated that Kurdistan Region does not need any other force. Reorganization and reunification of all the Peshmerga forces under the Ministry of Peshmerga Affairs authority have been one of the main objectives of the KRG eighth cabinet. He pointed out that, despite slowing down of the reunification process of the Peshmerga forces due to war against ISIS, little, but significant, steps have been taken. KRG Peshmerga Minister considered that the prompt implementation of this task has now become a necessity in order to eliminate the threats which face the Kurdistan Region, and create a one united stance, away from religious, ethnic, and political differences. Sayd Qadir denied that any political party has tried to hamper the reunification of the Peshmerga forces, saying that some statements, which have been made, reflect only individual opinions. Regarding the current situation on the battle fronts, Mustafa Sayd Qadir said that ISIS terrorists attack Peshmerga positions on a daily basis, but Peshmerga forces stop their advances. “Now, Peshmerga forces have learned the tactics of the terrorist of ISIS, and I reassure Kurdistan citizens that the Peshmerga forces are capable to defend Kurdistan Region. They have shown that whenever a security problem occurred, they acted rapidly and restored security”. He reiterated that the anticipated operation for liberation of Mosul will also have a significant impact on the process of liberation of Sinjar. The minister pointed out that defeating ISIS in Mosul will further consolidate stability and security of the Kurdistan Region. He stressed that Mosul will not be liberated by Peshmerga forces alone. Erbil, Kurdistan Region, Iraq (cabinet.gov.krd) – Kurdistan Region Deputy Prime Minister, Qubad Talabani, yesterday received a delegation from German Parliament, which included representatives from Christian Democratic Party, Social Democratic Party, left Party, and Green party. The aim of the German Parliament delegation’s visit to the Kurdistan Region was to closely observe the military, humanitarian and economic situation of the Kurdistan Region. The members of the visiting delegation expressed their appreciation for the fact that, despite the war against terrorism and the economic crisis, the Kurdistan Regional Government, KRG, has been able to protect the Region’s peace and security, and provide shelter and assistance to scores of refugees and displaced people, who fled the violent repression of the Islamic State terrorist organisation, ISIS, and took refuge in the Kurdistan Region. They reiterated their support both at humanitarian and military levels. The German Parliament delegation also hailed the peaceful coexistence, which prevails among the religious and ethnic communities in the Kurdistan Region. Deputy Prime Minister Talabani expressed his appreciation for the visit, and stressed that Germany has assisted Kurdistan Region in hard days, particularly by providing military aid and training to the Peshmerga forces that have resulted in positive achievements and progress in the fight against ISIS. He urged Germany to continue its support and assistance as, despite the fact that Peshmerga forces have been successful on the battlefront and taking back Kurdistan territories, the terrorist threat has not been definitively eradicated. Deputy Prime Minister Talabani briefed the German Parliament delegation about the Kurdistan economic situation and the background of political differences between the KRG and Iraqi Federal Government. The meeting was also attended by KGR Minister of Interior, Karim Sinjari, Minister of Planning, Ali Sindi, Minister of Health, Halkawt Hama Rashid and KRG Spokesperson, Safeen Dizayee. Yesterday the Kurdistan Regional Government (KRG) Representative to Spain took part in a conference titled “Kurdistan: Past, Present & Future” at the University of Rey Juan Carlos. The conference was organised by the Association for Humanitarian and Student Development & the University of Rey Juan Carlos in collaboration with the KRG Spain office. The conference also included the participation of the Professor of International Relations at the University of Rey Juan Carlos, Pontificia Comillas Alberto Priego, Kurdish blogger and journalist Zinar Ala, and International Policy Analyst, Antonio Ponce. Daban Shadala provided the attendees, made up of students from the university, with a history of the Kurdistan Region. He then went on to provide an insight into the relations of the KRG with neighbour states and an analysis of Daesh and the impact that the terrorist group has had on the region. Moreover he asserted that the Peshmerga, made up of both men and women, have been “crucial in the global fight against terrorism and defeating Daesh”. “As a result of the onslaught by Daesh in Iraq last summer we as the Kurdistan Region have received overwhelming numbers of refugees” he went on to say, “and we are doing our utmost to support them”. Professor Alberto Priego then gave his insight into the terrorist organisation Daesh, its structure, organisation, financing, ideological beliefs and political goals. Zinar Ala then discussed the situation of the Kurds of Rojava, the defence and liberation of Kobane and the role of women in the fight against terrorism. The final speaker was Antonio Ponce, a journalist and political analyst who recently spent time in Kurdistan, who discussed the plight of refugees and the genocide against the Yazidi Kurds. The conference was a great success and yielded a diverse array of questions from the students, who are clearly well engaged in international politics and keen to see support from the international community given to Kurdistan. Twenty seven years ago, the Kurdistan people were subjected to a brutal campaign of extermination, called Anfal, which aimed at cleansing our people’s existence and national identity. In addition to the destruction of thousands of villages, over 182,000 innocent citizens of Kurdistan were exterminated and martyred, during this campaign. As we commemorate the anniversary of those bitter days, several years have passed since the Baath criminal leaders, perpetrators of the Anfal campaign, were prosecuted, and the Iraqi High Criminal Court recognised the Anfal campaign as genocide against the Kurdish people. Now, as its legal, moral and national obligation, the Iraqi government has to compensate the survivors and families of the victims of this campaign, both morally and financially, and conduct environmental improvement campaigns in the regions which were subject to this criminal campaign. The Kurdistan Regional Government, KRG, will continue in its effort to find and bring back the remains of the victims, sons and daughters of our people, to be buried in their ancestral homeland. It is always attentive to improving the living conditions of the families of the victims of Anfal. The KRG will continue its campaign to obtain international recognition of Anfal campaign as genocide. Today, our nation is facing a campaign, similar to that of Anfal, conducted by the Islamic State terrorist organization, known as ISIS. Therefore, the people of Kurdistan, all the sections of the society and political parties need unity of ranks more than ever, in order to defeat the terrorists and the enemies of freedom and humanity. We are confident that ISIS terrorists will meet the same fate as the Baath leaders, perpetrators of the Anfal genocide. Erbil, Kurdistan Region of Iraq (Krp.org) – President Masoud Barzani welcomed a delegation from the Federal Government of Iraq headed by Prime Minister Haider al-Abadi. The delegation included a number of military and security officials as well as immigration and other Iraqi officials. President Barzani and Prime Minister al-Abadi discussed the latest military advances by the Peshmerga forces and commended their achievements and also the Iraqi armed forces and the latest advances against the terrorists of the Islamic State in the city of Tikrit. The two sides also spoke of the upcoming operations especially regarding the liberation of Mosul from the hands of the terrorists of the Islamic State. Prime Minister al-Abadi stated that the mutual interests of the Kurdistan Region and the Federal Government in Baghdad are far more significant than any obstacles. On his part, President Barzani stated that the cooperation between Erbil and Baghdad will continue and that the relations between the two will only be strengthened. Prior to the completion of the Prime Minister’s visit to Erbil, President Barzani and Prime Minister al-Abadi visited the refugee camp of Bahrke in the outskirts of Erbil to see the current situation of IDPs from the Nineveh plains and other areas that have been under the control of the terrorists of the Islamic State. President Barzani and Prime Minister al-Abadi both stated to a number of families in the camp that their main priority is liberating their areas and ridding Iraq of terrorists. The purpose of the delegation’s visit to France was to request further weapons and increased military aid for the Kurdistan Region Peshmerga forces, particularly heavy weaponry, and increasing the level of training of the Peshmerga forces. The meeting was also attended by the French Minister of Defence, Jean-Yves Le Drian, the special Chief of Staff of the French President, General Puga, and a number of the French President’s advisors. 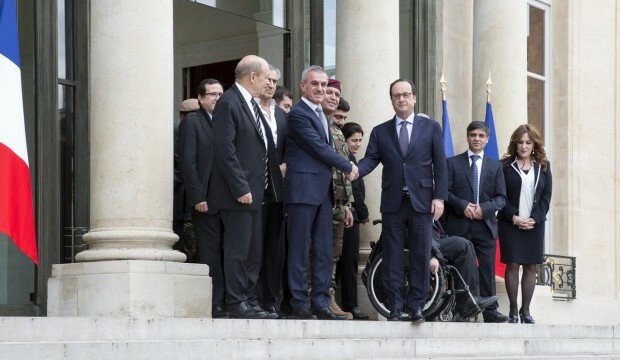 The French President expressed his understanding for Peshmerga’s needs for advanced weaponry and pledged to undertake his utmost efforts in order to meet these demands. 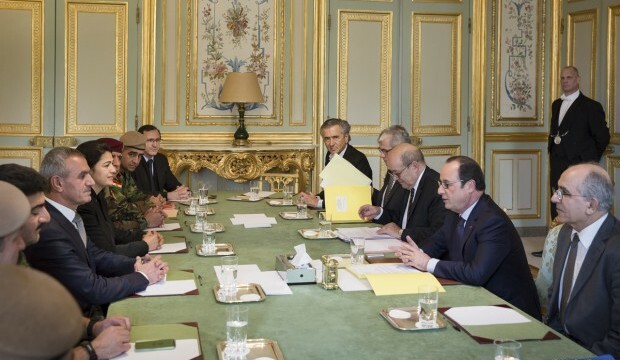 After listening to the requirements of the Ministry of Peshmerga Affairs delegation, President Hollande said, “It seems that the situation is urgent and I will ask the Minister of Defence to study these demands and see how can we meet these demands quickly.” He also announced that the French Defence Minister will be visiting the Kurdistan Region in the coming few weeks. The meeting between the military delegation from the Kurdistan Region and the French President came at the initiative of French philosopher and writer, Bernard-Henri Levy, who visited the battle fronts in the Kurdistan Region last February, and vowed he will urge the highest authorities in France to provide better and more military assistance to Kurdistan Peshmerga forces. Following the meeting with the French President, a broad public meeting was held later in the evening between the Ministry of Peshmerga delegation and a large number of well known French personalities, writers, intellectuals, friends of the Kurdish people, as well as members of the Kurdish community in France. In this meeting the Minister of Peshmerga and the members of the Kurdistan Region military delegation briefed the audience about their visit to France and the current situation and developments in the war against terrorism. Earlier, the Kurdistan Regional Government Representation in France hosted a meeting for the Minister of Peshmerga Affairs with researchers and experts from the French Institute for International Relations, IFRI. The visiting delegation from the Kurdistan Region also visited the prestigious Institute of Advanced Studies in National Defence. The delegation was received by the President of the Institute, and held a meeting at the office that was once used by Napoleon Bonaparte as well as Marshall Joseph Joffre the General Commander of the coalition forces during the First World War. On the last day of its visit, the Ministry of Peshmerga Affairs delegation met the French parliamentary group of Study on Kurdistan Region of Iraq, headed by former French Minister Pierre Lellouche. The Minister of Peshmerga Affairs briefed the French parliamentary group about the latest political and military situation in the Kurdistan Region, in particular the situation in the battlefronts against ISIS. Lellouche said that as head of this parliamentary group and as a member of the opposition in France, he fully supports the Kurdistan Region in its war against terrorism.